A busy mom and lifelong yogini who is passionate about transformation, community and living in service to the divine. I absolutely love working with women who also feel a deep pull towards truth and awakening. Isn't it time we stop trying to be something we are not? To celebrate the fullness of who we are? To show up authentically... however messy or magnificent that may be? While I may take the seat of the teacher now and then, you will never hear me claim to be perfect or have it all figured out. I have more than my share of struggles and fears. I know what it’s like to get pulled into riptides of doubt and confusion and painful forgetting. And I also know the sheer bliss that comes from living a life in intimate connection to grace. Over the years I have been fortunate to study with some pretty amazing teachers and I am grateful for every wacky twist and turn in my life that has led me to this point. After many, many years of study and practice and the deep learning that comes from living constantly at my edge, part of me still trembles in fear as I continue to grow. Crawling out of my comfortable cave into the bright light of a fully given life, I am doing my best to keep trusting the unseen forces that have been guiding me along the way. I have found the love and support of others to be an essential part of my journey. This is one reason why I am so passionate about creating connections and building community. In the eyes and hearts of others I find reflections of where I am already open and where I have room to grow. Yoga and community are both powerful tools for transforming our limiting beliefs and finding more freedom in our lives. It is my intention to help people come into more connection with their true selves, each other and the divine grace which holds us all. Rather than doing yoga to get flexible or perfect a pose, if you practice with me, I will invite you to use your time on your mat to awaken your heart and align with the essence of who you are. Getting in touch with who you are beneath the story of your life, makes it possible for you to uncover your innate vitality, happiness, inner strength and capacity for love. I am dedicated to living at the edge of conscious evolution and I am as committed to my own growth and unfolding as I am to serving others. I take every opportunity I can to deepen my own knowledge, experience and understanding of all things related to yoga and to living an empowered and awakened life. I have lived much of my life as a modern day spiritual seeker and workshop junkie. Over the last 30 years, I immersed myself in thousands of hours of training. Everything from psychology to group leadership to asana alignment, pranayama, meditation, philosophy, therapeutics, advanced studies and subtle body energetics and so on. I completed my first 200-hour teacher training in 1998 and have attended many more since. A few of my most influential teachers have been Richard Freeman, John Friend, Douglas Brooks, Sofia Diaz and Chameli Ardagh. Fascinated by the way our life experiences can settle into our bodies, in 1997, I completed a 6 month Trauma Training with Hakomi Integrative Somatics. Then, hoping to explore the body mind connection even further, in 1998, I earned a degree in psychology from Naropa University. I returned almost ten years later to participate in their 1000 hr Yoga Teacher Training Program, both as student and as an assistant to Nataraja Kallio and Sri Devi Bringi. 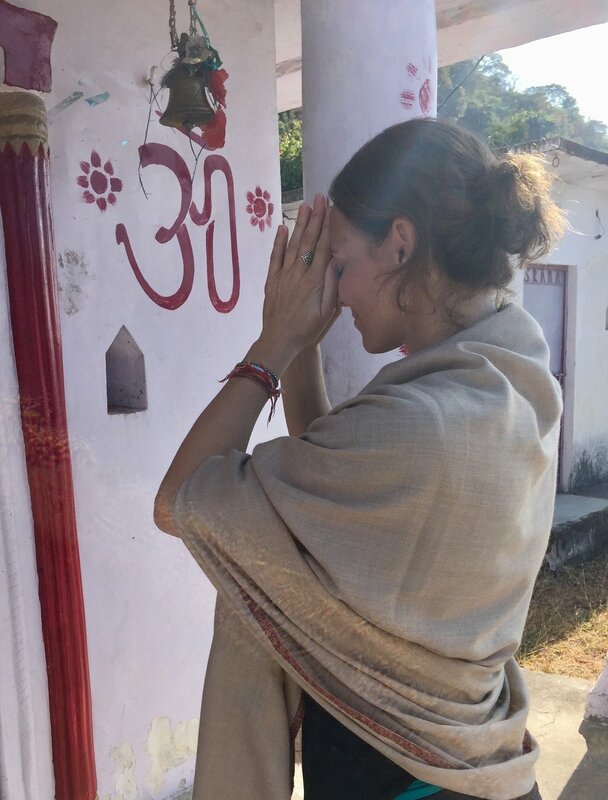 Madly in love with India since the first time I visited in 1999, I have gone back several times since to study with various teachers, lead retreats, visit sacred temples and immerse myself deep in the roots of the yogic traditions. You may feel the impact this has had on my teaching when I weave in myths about the different gods and goddesses, explore the power of mantra and mudra and consistently invite students into the heart of yoga that goes far beyond the physical. My classes attempt to hold the paradox of being a sanctuary for restoration, renewal and inspiration while simultaneously being an alchemical cauldron for radical transformation. I am super passionate about creating connections and a sense of community among students. I have attended several programs with the Matrix Leadership Institute and participated in Women’s Group Facilitator Trainings with the Awakening Women Institute in California. My own radical transformation as a woman and yogini has inspired me to work with the energies of the divine feminine and use yoga and connections to help to empower, heal and awaken. I feel strongly that when we come together in community we can support each other to step into our full potential and live as forces of love and positive change in the world. A dedicated yoga practitioner since 1989, I am an E-RYT 500 instructor with over 20 years of teaching experience. In addition to leading ongoing classes, workshops and retreats, I have developed several Yoga Alliance approved teacher-training programs and absolutely LOVE what I do. I founded Devi Yoga for Women in 2013 with the hope of creating more opportunities for women to learn how to live yoga inspired lives in todays fast paced and often disconnected world. Sometimes I jokingly refer to myself as a yogini goddess supermom, and some days it almost does feels like that. Mostly though, its not that glamorous. Dishes and carpools, working at my desk while simultaneously hollering at my kids to stop fighting. Dreaming big about making a difference for women in the world and trying to celebrate simple goodness in every ordinary day. Grateful for my family, our health, heartbreak, magic, the Rocky Mountains, side splitting laughter, gluten free chocolate chip cookies and the yoga that keeps me sane. Moment by moment, breath by breath, navigating the wild currents of this crazy beautiful life with a little grace and a whole lot of love. I hope we can practice together soon! I am attracted to Kirsten's yoga classes, because she brings to her practice a graceful and unique spiritual presence. Her gentle guidance and attention to detail make her an outstanding teacher. is a true blessing and creates the safe space I need to relax and let go. with states of consciousness. I never have enjoyed dancing at my edge as much as with her! Yoga with Kirsten was divine. She helped me open doors not only in my physical body but also in my heart. Her words and the practice were so much one - unbelievable. I was asking myself what magic made IT flow like that. This experience I will never forget.